Hundreds meet at Cony High School to help a Christian nonprofit in its goal of providing more than 100,000 meals. AUGUSTA — It’s not that Alexis Everett didn’t have other things she could have been doing on a Saturday afternoon, but the 16-year-old from Chelsea said there was nowhere more important for her to be than volunteering alongside her grandmother, scooping cupfuls of soy and rice into bags that will feed hungry people in need in one of 70 countries. Everett joined hundreds of volunteers in packing more than 100,000 meals Saturday for Feed My Starving Children, a Christian nonprofit organization that will distribute the bags of food, each of which contains enough food to provide a meal for about six people, to people in developing nations struggling to find enough food to survive. Her grandmother, Sandra Mason of Augusta, who scooped a powdered vitamin mix and dehydrated vegetables into the bags, said she thinks the event won’t only benefit starving children in foreign countries but also the approximately 500 people who came together at Cony High School to pack the bags of food. Working at the same packing station were Philip and Jamie Smith of Damariscotta and their 7-year-old triplets, Elijah, Moriah and Zuriel. The siblings took turns at different jobs, switching between filling bags with a funnel, sealing the bags up to keep the contents in place, and packing the finished bags into boxes, 36 to a box. Philip Smith said they came because it seemed like a great opportunity to do something with their children that helps other people. Jamie Smith has done overseas mission work previously, in Peru, and worked at an orphanage in Guatemala. She said she knows from experience that the type of healthy, protein-packed meals they were packing up Saturday will be appreciated by the hungry people who receive them. “When you don’t have any food, you’re very grateful” to receive it, she said. 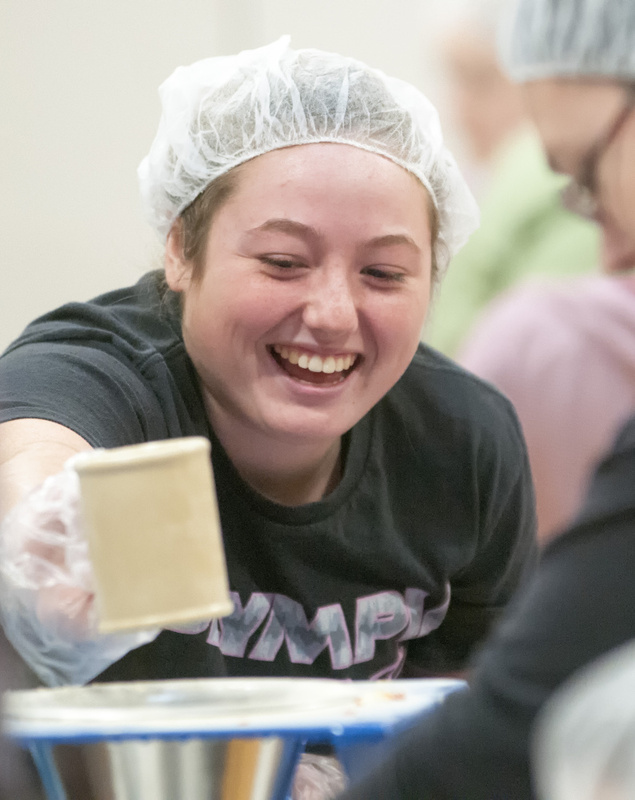 Three shifts of area residents worked to pack food Saturday, each building toward the group’s goal of packing enough food for 101,088 meals.